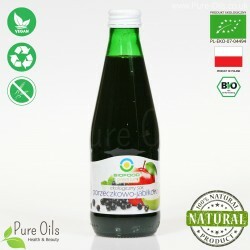 Chokeberry-apple juice comes from organic farming and has a BIO Certificate No. PL-EKO-07-04494. It is a 100% natural product. The juice is formed by pressing apples and chokeberry. Not from concentrate. Chokeberry is a source of ,biologically active compounds including anthocyanins (dark dyes) which have antioxidant properties. Acidity pH 4-5. It is a naturally cloudy and pasteurized product. The sediment is formed by the natural ingredients of organic apples and chokeberries. Store in a cool and dry place. After opening store at a temperature of 4 degrees Celsius. Shake before drinking. supports the work of the pancreas and liver. 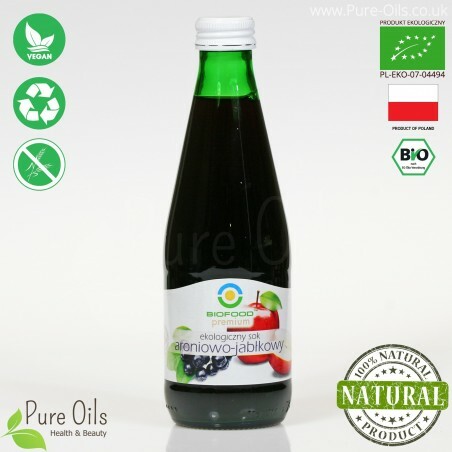 Juice from organic apples 50% and organic chokeberry 50%.